California real estate is highly coveted by buyers and investors everywhere. When you’re ready to sell your home, you need the most experienced, innovative and responsive real estate firm in the market: Pacific Union International. Pacific Union was born in California in 1975 — a single office in San Francisco founded by two entrepreneurs. Today we’re the number one independent real estate firm in California. In January 2018, Pacific Union International joined forces with three powerhouse Los Angeles brokerages, John Aaroe Group, Partners Trust, and Gibson International to become the leading independent firm in the market with $14.13 billion in annual sales, 50 offices, and 1,700 closely connected real estate professionals from the beach to the foothills. Pacific Union International is known for exceptional property marketing, characterized by the quality and attention to detail critical to capturing the attention of your buyer on day one. Our in-house marketing team will devise a multichannel launch strategy for your home, starting with photography, video and professional copywriting. Your custom-designed plan will maximize the impact of your home’s debut and maintain visibility for your property until it’s sold. OUR MARKETING TECHNIQUES GENERATE OVER 1 BILLION IMPRESSIONS EACH YEAR. Established in 1975, Pacific Union is NorthernCalifornia’s most dynamic and innovative real estate firm. Operating in eight regions - San Francisco, Marin County, Sonoma County, Napa County, the East Bay, Contra Costa County, Silicon Valley, and Lake Tahoe/Truckee - we set the standard for elite performance. In 2015, our over 690 real estate professionals ranked third in the nation for average sales price and ninth in sales volume, and we are the ninth fastest growing firm among brokerages above $1 billion in sales.Pacific Union’s leadership operates with an entrepreneurial mindset. Our firm’s unwavering commitment to investing in the right people, processes, and tools is the key to building deep and long-standing relationships with our clients. We’re also the only Bay Area real estate brokerage to invest strategically in a range of professional services - home insurance, corporate relocation, and property management - to ensure that our clients fully maximize the value of their real estate assets. Serving over 195 communities, our real estate professionals have substantial experience and knowledge of each area, from the most desirable street in the neighborhood to current market conditions and future trends. 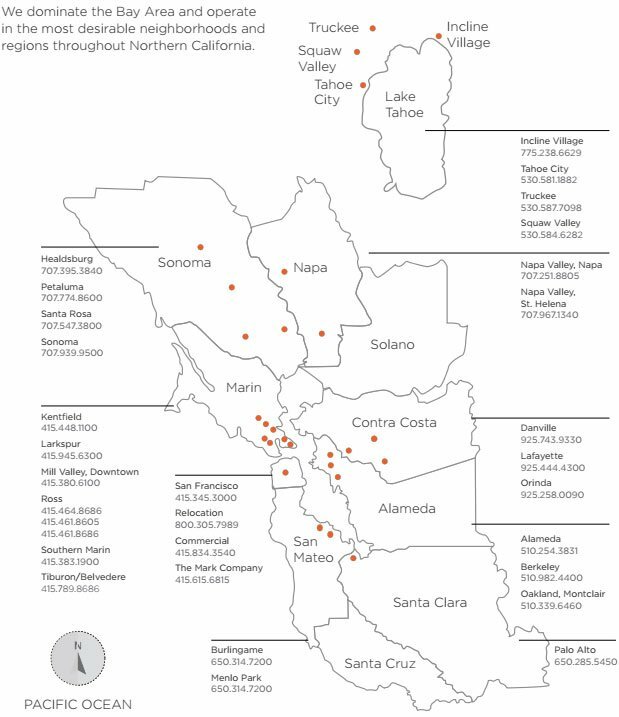 With over 690 real estate professionals in eight regions, we have a highly localized presence throughout Northern California. Our digital content editors regularly research and write about local market conditions and real estate trends that influence buyers and sellers, keeping our teams uniquely well informed. We reach over 200 countries through our newly optimized website, with overall traffic increasing 46 percent year over year as of March 2015. We leverage the most advanced digital channels and technology – including video, microsites, online advertising, social media, mobile search and SEO, and customized reporting. We distribute full details about our clients’ homes to leading real estate and media sites within 96 hours of listing on the most popular mobile devices so buyers can find our properties from anywhere. Pacific Union is the ninth fastest growing real estate brokerage above $1 billion. In 2015, it ranked third in the U.S. for average sales price and ninth in sales volume.